On 14 April 2014, around 270 girls were kidnapped by Boko Haram from Chibok in Nigeria. Boko Haram is a group of Islamic fundamentalists whose very name translates as “Western education is sinful”. The Western world exploded in outrage. There was report after report on the BBC and all Western media condemned this vile and unacceptable treatment of the girls. We heard Angelina Jolie, as someone who has been campaigning about violence against women, express her concern. US Senator, John Kerry, became very vocal in the media, talking about the action being taken by the US to attempt to trace the abducted girls. The USA, the UK and France put special forces on the ground in Nigeria almost immediately to assist the Nigerian authorities who were overwhelmed by the issue. We witnessed President Francois Hollande of France hosting Nigeria’s President Goodluck Jonathan in a head of state conference aimed at tackling Boko Haram. The UK’s then-foreign secretary, William Hague, opined “The first focus of everything we do now is about the girls, of course it is“, Ref..
And we had the spontaneous Twitter campaign #BringBackOurGirls demonstrating the popular empathy for the girls and horror at their treatment by these appallingly violent religious zealots. We saw Barack Obama take the unique step of yielding up his weekly presidential address to his wife, Michelle Obama, so that she could emphasise the outrage and distress she personally felt at the Nigerian girls’ kidnappings. She made a YouTube video to drive home her message of support and condemnation, Ref.. The targeted message of this video was that Boko Haram is specifically attacking the education and emancipation of girls – and so is explicitly a feminist issue, an instance of female oppression in a violent, patriarchal culture. Any decent person will have no hesitation in condemning in the strongest possible terms the treatment of these kidnapped girls. And the outrage being expressed by the world, as summarised above, is entirely understandable and proper. So what is my concern? And why do I raise this issue again, some six months after the event? Well, today, the 17th October 2014, the kidnapped girls of Chibok are again in the news. It seems that Boko Haram might have been induced to let them go, if you believe it, Ref.. Let us hope that it is true. The reason I raise the issue again is, amid the rejoicing at the anticipated return of the girls, no one is mentioning those who will not come back: the dead. For Boko Haram’s principal activity is not kidnapping but killing. Nor do they specifically target females, as most of the Western media and political commentary would suggest. On the contrary, the 2014 Chibok kidnapping was the only instance of a girls’ secondary school being attacked, according to Ref.. Boko Haram oppose Western education for both sexes, not just girls as Michelle Obama would have us believe. Indeed, they oppose all things Western. Boko Haram’s attrocities started in 2009. By the time of the Chibok attack they had already killed in the order of thousands, mostly men and boys. For example, just a couple of months before the Chibok incident, Boko Haram killed 29 boys as reported in Ref. : “The militants locked the door of one dormitory where male students were sleeping and then set it ablaze, slitting the throats of those who tried to clamber out of windows and gunning down those who ran away. 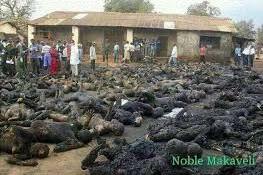 Many were burnt alive.” The attacks by Boko Haram on schools in Nigeria have been going on for years, previously killing over a thousand boys, perhaps several thousand (200 in one week according to the above report). The abduction of females is a relatively new occurrence. Until April this year the girls were simply told to leave and not come back. The killing of men and boys, often by being burnt alive or by beheading, had been going on for years before Chibok (see the timeline in Ref.). But as long as the girls were being spared, the mere killing of men and boys did not merit any media attention in the West. It still doesn’t it seems. Six months after Chibok the media are now taking an interest in the kidnapped girls again, anticipating their release. Nothing at all wrong with that, of course. But not only does the establishment media still remain silent about the thousands of men and boys who died before Chibok, they also steadfastly refuse to acknowledge that more than a thousand people – mostly males – have died since Chibok. What excuse now? Certainly not that their attention has not been drawn to Boko Haram. Note how contrary this is to Deborah Orr’s Guardian account. The Western media were not slow to pick up the story of the kidnapped Chibok girls – they were noticeably quick compared with the years of ignoring Boko Haram’s killings, predominantly of males. And the suggestion that this supposed tardiness might be because society believes that “females don’t matter” is the exact opposite of the truth. It was the targeting of girls in the case of Chibok, and that alone, which finally drew the world’s attention to Boko Haram. But still the world wears its gender-filtered spectacles. It is not credible to suppose that the staff at the BBC and The Guardian and elsewhere could be unaware of the mass killing of boys and men. They are journalists. If I know, they know. The most benign explanation for the bias in reporting is that the public’s emotional response to killing males is so muted that it fails to make it over the editorial bar. Don’t drop the dead donkey – drop the dead boys, keep the donkey. And that’s the most benign explanation. The alternative is that the omission of any mention of what has been, and continues to be, happening to boys and men is deliberate policy. To mention the boys’ fate would undermine the propaganda value to the feminists of the girls’ victimisation at Chibok. Only females can be allowed to play the victim’s role. Males must appear only in the role of perpetrators of violence. The alternative explanation is that the flagrantly biased reporting of Boko Haram’s activities is an example of the cold blooded – and cold hearted – feminist propaganda machine in action. Actually both explanations are true. A public with little compassion for male victims is the loam in which feminism has taken root. That the feminist lobby is instrumental in the response of the media is demonstrated by Barack Obama’s readiness to hand over his weekly presidential address to his wife – for the purposes, of course, of underwriting his own feminist credentials. Recall that this is the president who thinks it acceptable to talk of a 23% gender pay gap, a flagrant piece of pandering to the feminist lobby. And note that Michelle Obama’s video, Ref., made no mention whatsoever of any victimisation of males – it was solely concerned with girls. Bear witness to this: the unholy alliance between the feminist ideologues and senior politicians, of both sexes, which makes the feminist position so frighteningly strong. Ref. gives a list of Boko Haram’s atrocities. There have been at least a further 19 since Chibok, many leaving the order of hundreds dead. For example, they attacked the twin towns of Gamboru and Ngala in Borno State in May, shooting in a busy marketplace, setting houses on fire, and gunning down anyone who tried to flee. The death toll of this massacre has been set as high as 336. In August there were 28 civilians killed and 97 people were kidnapped, all men and boys, in attacks on villages in Borno State. But still the Western media generally reports only the Chibok episode, the one instance where a girl’s school was the target. No one decries the thousands dead, mostly males. And no one has started a Twitter campaign to #BringBackOurBoys – for example, on behalf of the 97 kidnapped in August, not to mention many others. Because the disadvantage and suffering of males, even those of tender age, does not register a compassionate public response. Compassion is reserved for females. This is the compassion gap. And it is in this gap that feminism flourishes. There is no political capital to be had by expressing outrage at the treatment of males. Why? Because it is just business as usual. The feminist controlled media present Boko Haram’s actions falsely as “violence against women”, the public outrage is whipped up, and the politicians are obliged to appease both the feminist lobby groups and the public generally by being seen to be protective of females. Where are men and boys in this playing out of the political farce? Nowhere. They have neither voice nor sympathy. So it is that the death of males is transmogrified into a reason to protect females. I am by no means alone in making these observations. (There are noble exceptions in the media by individuals who have pointed out the bias in reporting, such as Ref. [5, 7-9]). But those of us who are aware of it are not those who control the media and control the public mind. Noah Rothman in Ref. concludes, “an even more disturbing question needs to be asked now: why did the press spring to action when young women were kidnapped, but were virtually unmoved when it was young boys who were being slaughtered and burned alive?” This bias of the media encourages those who are naturally disposed to be biased in the first place, feeding their prejudice. An example is the following commenter on a newspaper site, Cartimandua, “The reason those boys were killed is Muslim societies and tribal African societies don’t keep girls alive. If you want fewer dead boys you have to stop the society abusing the girls.” According to this pernicious mindset whatever happens to boys it is always, always, always females who are the true victims – even when it isn’t. Yes, burn to death a thousand boys and guess what? It’s girls that are the real victims. This is feminism. It is not compassion. It is not equality. It is repugnant. This entry was posted in newspapers, other countries, TV/radio on 18th October 2014 by William Collins. It’s simple, and elegant. Horribly repugnant and downright evil, but simple and elegant. The public would care just as much for their fallen brothers as their fallen sisters. The solution? Lie to them, tell them the sisters ache when in fact the brothers do, and the sisters sit pretty. Make them stop caring about their fallen brothers. Excellent. Might it be possible, please, for you to enable Press This and Reblog on this blog?